The past few months were quite of a journey for us and we are happy to finally share some news with you! We are pleased to announce SynthesisVR 3.6 is out now! With versions 3.4 and 3.5, we brought a good number of updates to further polish SynthesisVR and make it work great with all the challenges that arrived on Windows 10 and SteamVR. All your support and feedback was tremendously helpful to get us to the top of such a competitive ecosystem as the LBVR is. So, what really all that means? We teamed up with Ubisoft to bring you Arcade Exclusive games through Uplay. 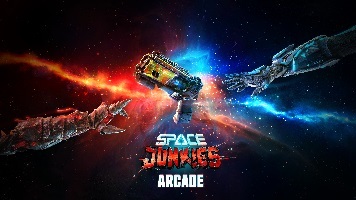 Please welcome Space Junkies Arcade! Gear up with insane weapons, from Sunblasters to Bioguns, and use both of your hands to combine weapons with equipment when stalking and taking down your opponents. Virtual Arctic Expedition is a virtual reality experience involving up to 4 people at the same time. The users are immersed together in the same virtual environment. They find themselves in the Arctic seabed where everyone embodies a scuba diver. You won’t find those 3 titles on Steam! In December, Kamen (our CTO) flew to Rome and met with Bernard Frischer – Professor of Art History and Classics at the University of Virginia. As long Bernard and his vision for VR are remarkable, his work in the field doesn’t fall behind. Rome Reborn VR speaks for itself! All the 3 experiences are now available on SynthesisVR and we are working closely to provide all VR location owners with detail instructions on the best ways to present them to the customers. From Mass Effect, Tomb Raider, and Saints Row industry veterans, comes a never-before-seen VR experience. Inject your own style into the story, as you command Sergeant Sarah Pearson, and the XR71—the galaxy’s most advanced fighter—on a top-secret mission. Trinity VR is not falling behind, as it is one of the most well polished cinematic VR experiences. Who am I? What role do I play in the story? You will want to experience Trinity more than once in order to explore the full VR world and make sure you don’t miss any of the interactive elements! And that’s not all. We have 3 more excellent suggestions. Sam & Dan: Floaty Flatmates is a co-op VR game where communication and teamwork is key. Your buddy is trapped in a different building across the street, work together to get supplies to build a bridge towards a boat. Find tools to make communication easier, like a tin can, that can be used as a can phone. Also avoid falling in the water, there’s a big shark! It’s been six years since the Undead War shattered the world. Nightmares stalk the land, and sickness and death pervade the world. At the center of this nightmare, the Witching Tower’s Queen directs the chaos, feeding, and growing stronger. SynthesisVR now automatically recognizes your games catalog and let it start the games through SynthesisVR. Yes, 2019 is here and the evolution of LBVR is inevitable. Stay tuned on how to make the most of it!